From the Secret Origins Special #1. 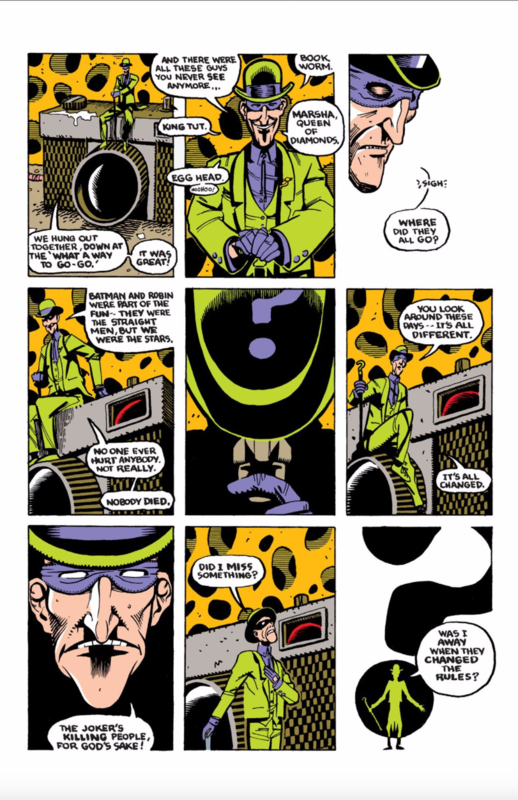 I've always liked the Riddle as the villain that really didn't want to kill anyone or was homicidal. I hate the modern need for him to be a killer like all of the other parts of Batman's rogues. Yeah that's one of the issues I have with his character on Gotham at the moment. To be fair writing Riddler as homicidal was before Gotham, with both the Arkham games and comics having him enjoy and perform murder. In all fairness he was introduced using deathtraps on people, his scaling up to Saw-level stuff in the games isn't THAT out of character for that version of the character. But, yeah, him as a gray-area PI was more interesting thnan as a supervillain. Y'know what? This is the comic book equivalent of "Back in my day..."
For all the good and bad connotations that it implies. Because there's both. I'm sure it was a fairly valid point back when it came out, but nowadays I don't think pining for just the good old days is particularly constructive, nor have I ever cared for this particular kind of meta material. Plus, this feels just a little bit disingenuous considering that it's coming from the writer who did Doctor Destiny's Diner of Death, AKA 24 Hours in the pages of Sandman. Well Sandman was an adults only comic, I don't think he ever wrote mainstream superheroes like that. Gaiman certainly was never the worst offender, I just think it's worth noting that he's the guy (maybe along with Morrison since Arkham Asylum was around the same time) who turned Doctor Destiny from a weird JLA villain into an emaciated murderer. Constantly toting this 'pining for the past' attitude unintentionally undermines the modern-day work of both a) creators of 'fun' projects, a.k.a. the ones actually applying the message and succeeding for it, instead of just on-the-nose restating it; and b) creators who can use death and other 'mature' themes as a functional part of their story, and not as mere EC-style shock value. You're assuming the character's point of view is the author's, which I don't think is the case. 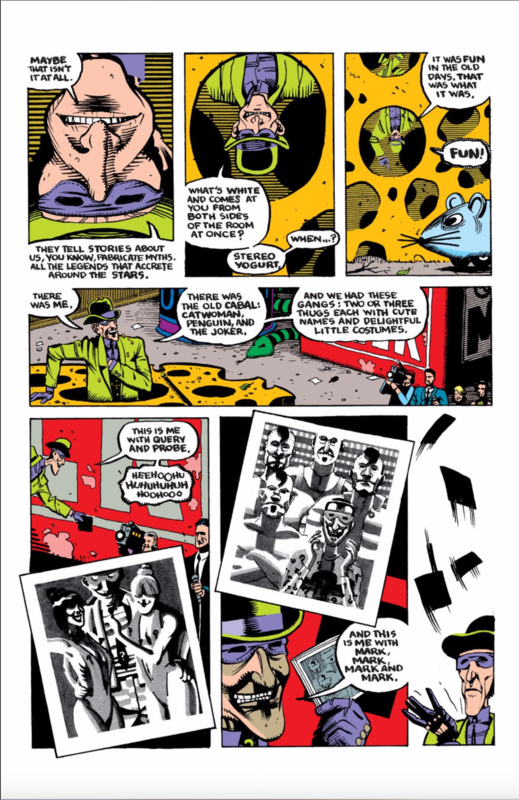 Gaiman's the man who said of WATCHMEN and DKR, and I'm paraphrasing, "Superheroes weren't deconstructed in the 80s. They were, just briefly, actually respected." This just rings false coming from the Riddler. I assume it's referring to the Adam West Batman what with the references to King Tut and so on, but Frank Gorshin was the most, uh, intense dude on that show. There's an episode where the Riddler is waxing rhapsodic about medieval torture devices. Indeed, Gorshin is brimming with hyperactive homicidal glee in all of his performances (channelling his best Jimmy Cagney in White Heat impersonation but MORE intense). IIRC He's also one of only two villains in the show whose plans lead to actual deaths; His moll, Molly, was accidentally vapourised by an atomic reactor when she infiltrated the Batcave (dressed as Robin... watching Burt Ward impersonating Jill St John impersonating Burt Ward was quite something!) in the first story, and a couple of assassins are killed in their own crossfire in the Zelda the Great story. 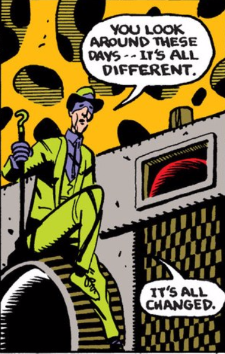 Hm, there was this weird period in the 80s where the Riddler was being treated as a kind of loser character compared to the rest of the Batman rogues. In this story he was the foreman of a warehouse where the old overlarge props from the Silver Age where being housed, and he only dressed up and put on this routine for a news crew doing a report on Batman. There was also a Question story that may have come before this, where Eddie is released from Arkham by Commissioner Gordon because he was deemed to be a harmless annoyance. He's then given a one-way ticket out of town, where his tales of his former occupation cause a random woman he met on the bus to declare herself to be his partner, and start killing people if they couldn't solve her riddles. Vic even let him go at the end of the story as it wasn't really his fault, apparently. 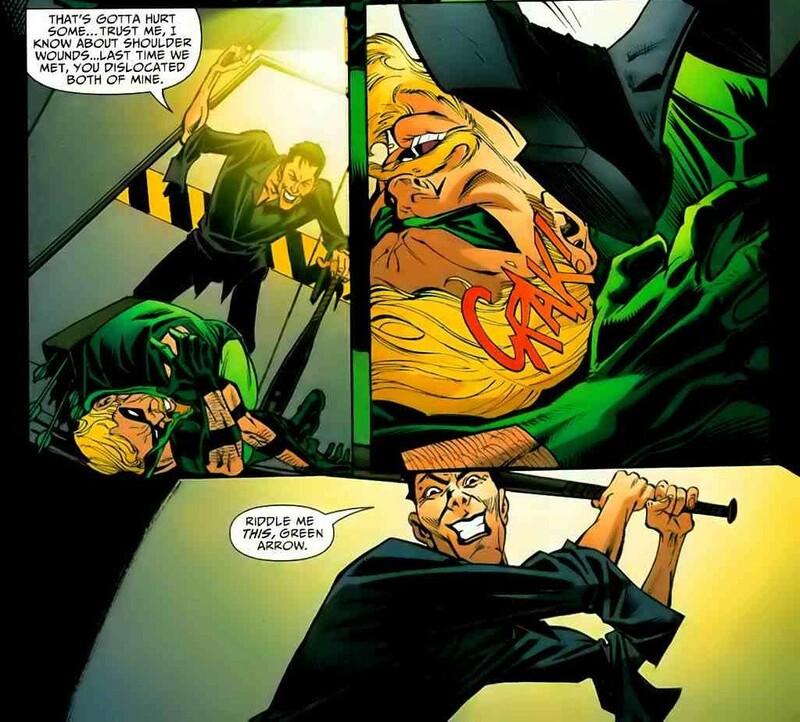 Come to think of it, in the pre-Infinite Crisis Green Arrow comics they seemed to have a weird fixation with picking on the Riddler, with Ollie even torturing him at one point for information when he was in police custody. This lead to him getting a questionmark tattooed on his neck, start wearing black clothes and lipstick in an attempt to be more edgy instead of the more BTAS version that appeared previously in the series. Oddly enough his scheme actually worked, and he managed to incapacitate both Ollie and Roy Harper if memory serves. Because the only way for Green Arrow to take you seriously is to act more like the modern version of the Joker, apparently. I think they appeared at more or less the same time in 2005 and I'm honestly not sure which came first in the design stage. Ah. I suppose it could be either. To be fair, the Riddler that appeared in 'The Batman' had quite a bit of motiviation to be as villainous as he was, and not just from abuse suffered at the hands of Green Arrow (presuming that's the sole reason, as told above). Yes, he had been retconned into a villain who came up with grand schemes but just wasn't very good at the whole criminal thing, and had never in fact killed anyone despite his deathtraps, mostly I suspect because of the Dark Knight, Dark City" arc where the Riddler actually killing someone is something that is seen as being completely out of character for him. I was torn, I loved Frank Gorshin's dangerously mercurial Riddler a LOT, but on the other hand I like the idea that NOT all Batman's villains are murdering monsters, some are "just" criminals. BTAS writers noted that they used the Riddler more sparingly than any other classic Batman villain (He's in two stories and makes cameos in another two or three) because he was just so damned hard to write without having him cross over into Joker-type plots. I really enjoy this kind of meta work. I also appreciate his point. I'm not against changes in comics - that's inevitable, and there are lots of people who enjoy the darker, more violent stuff. If that's the case, great. But I like having a range of options - dark stories for those that like them, and more lighthearted stories for those that don't. For Context: This was from 1989. We were on the top of the Grimdark rollercoaster, where a LOT of comics were suddenly taking their cue from The Dark Knight Returns, just before we took the big plunge. This was written the year after The Killing Joke, the year after The Death of Robin. Batman had become ever increasingly grimmer and this was a partial reaction to that. It wasn't meant as an actual treatise against dark comics, per se, but a recognition of the sea-change in progress. Keep in mind that this was being written AT THE SAME TIME as Gaiman was writing the first year of his version of The Sandman, which was unquestionably dark. He's not spouting against everyone going dark, he's just reflecting on it and having a Silver Age character notice how things have changed and how quickly it happened. I mean, a few years earlier, the Joker was the ambassador to the UN for Iran, because REASONS. Things escalated quickly, is what I'm saying.